This 608-page book is perhaps the most comprehensive guide ever published to the region's vast cultural, historic and natural attractions. Author Christine A. Smyczynski includes evaluations of inns, bed and breakfasts, campgrounds and eating establishments. 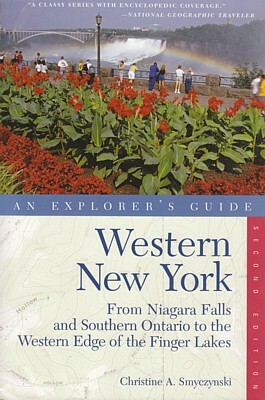 Written for a wide audience and completely updated throughout, this second edition is the perfect companion for visitors who want to know what else to see beyond Niagara Falls, and for natives seeking little-known, out-of-the-way places to explore. Parents looking for places to take the kids on vacation will appreciate the "kid-friendly" icons used throughout the book. If you are seeking a getaway without the kids, many romantic inns and sophisticated restaurants abound. Newcomers will enjoy Niagara Falls and, nearby, the Erie Canal ends its 340-mile trip as it empties into the Niagara River. With additional listings of annual events and festivals, there is literally something for everyone. As with all Explorers Guides, handy icons point out places of extra value, family-friendly establishments, wheelchair access, and lodgings that accept pets. Regional and city maps, as well as an alphabetical "What's Where" subject guide, simplify trip planning and getting around during your visit.